Someone's little hands are already trying to take my new toy. My mom bought it in her hometown in South Carolina. She went to a Best Buy about three hours after it went on sale. I pressed her and pressed her to go earlier but she replied “the people in this podunk town are too poor to buy anything”. Guess what? she was right. She walked into the store, back to the iPad section, and was second in line behind a guy who walked in just before her. The clerks told her earlier they had a long line, but she timed it just right to get there when no one was around. Fast forward a week and a few and it has arrived in Hong Kong. The post office made me go fetch and now I’m back starting the rather time consuming task of moving over all my stuff to the new device. First quandary was how to set it up–either as a “new iPad” or “restore from the backup of the old one”. I wasn’t quite sure so I went with the restore option, though in retrospect (i.e. the 20 minutes it took to do the restore) I discovered I could probably do it either way, syncing the apps and whatnot later on. First impressions is that it’s quite a bit thinner than the older one. The ‘scuba suit’ cover that was on the older version folds back and makes the entire iPad 1 look quite a bit ‘fatter’ than it really is. I’m still impressed when I see one of the originals without a cover (which is rare) as it looks so much smaller than mine which is wrapped in the Apple black latex. I got the ‘smart’ cover (black leather) that I’ll be setting up as soon as the sync is done (god it takes awhile). The new screen, sans fingerprint smudges and cracker crumbs and whatever else a year of use has puts on it, looks gorgeous. Of course it is basically the same as the old one, but it’s clean. I’m not going to sell the old one. While that’s normally my standard procedure as I’ve sold every iPhone I’ve ever owned right after buying a new one, this iPad had the secondary market take a hit with Apple’s price reduction, and we actually have a need for it in the house. The wife can’t use my computer usually as this room is too tiny, but she needs access to her email and celebrity gossip sites so iPad 1 becomes “hers” along with one of the boys, and iPad 2 is mine with the other kid. and a bunch of other stuff for about an hour and a half now…. Do a backup of your existing iPad before you start this process. Consider doing your first sync overnight when you don’t have to sit and watch the slow process. Ok, now to play with it. The magnetic screen cover works as advertised. Open it and it comes on, close it and close it and it shuts down. I’ve already noticed that I’m still hitting the power button to turn things off rather than just close the screen. Old habits will take a bit to slow down. The home screen now has two new icons. One is Photobooth, which you can use if you are feeling like self portraits with the rather grainy camera. The other is Facetime, which I’ve yet to check out. I showed the wife and let her hold both of them. 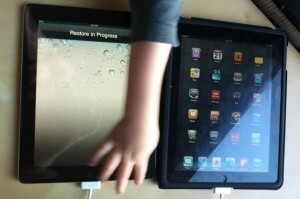 “The new one is heavier” she wrongly observed (iPad 2 is .2lbs lighter). It definitely is thinner. You can feel that holding it. It also feels ‘faster’. Some apps like Flipboard were really loading quite quickly, and I look forward to playing Infinity Blade later today. But now for the most important test: how much gloating can I do with this? I’ll be heading over to a few of my haunts today to be “that guy” who has the newest toy. Feel free to call me a jerk later if you see me. For those who missed the launch here is a nice collection of iPad videos from neonpunch.com‘s coverage of the Hong Kong iPad’s release. Strange things were afoot at the Starbucks. Two men next to us were sitting at a Starbucks table in Times Square, not a cup of coffee or even a bagel in sight. They were surrounded by stacks of paper, boxes, and empty shopping bags piled high. Next to them were several carry-on suitcases stuffed to the breaking point. And there in front of the one man was an iPhone 4. Now if this was an airport or a train station or any other place on any other day, you’d probably think nothing of their setup. But today was iPad day in Hong Kong, and we were just about 100 feet and 1 floor up from one of the largest resellers of iPads (with the longest lines) in the entire city. Something just didn’t seem right. One of the men looked up quickly when a gaggle of teenage girls cautiously turned the corner. They gave a quick nod over toward him and he jumped up immediately. He walked over and they handed over plastic shopping bags with large Apple logos on the side–two bags per girl, along with the receipts. In exchange each girl got $100HK (about $12 US) per bag. The girls promptly blended into the crowd of other shoppers and the man was busy stuffing boxes into his luggage. He then rolled his suitcase back to the Starbucks where it was stacked with other luggage, looking quite like a traveller ready to go on a journey. We had seen the mules in the line. Folks wearing masks, sunglasses and hats who were very shy when it came time for photos. People kept turning around, hiding under newspapers, even opening umbrellas to shield us from our cameras. The Bloomberg reporter told me “those kids are Triad members (Chinese mafia) who will be selling their iPads later today in Mongkok”. With that bit of warning we were both a bit hesitant to talk to the guys in the Starbucks, fearing they may be the ringleaders of some violent Ax Gang from a hard life council flat in rundown Kowloon. “I wonder if they could get me an iPhone 4” I thought to myself. The man came back from the girls with eight bags filled with iPads. His partner pulled out a legal tablet and made some check marks. The page was filled with dozens of check marks. 16gb, check, 32 gb, check, 32gb 3G, check, check. Of course, looking over to our table was probably just as confusing for the two smugglers. We were frantically busy uploading video of the iPad launch to Youtube and had two Mac laptops, a mifi, an iPhone 3G, a Sony HD Camcorder, a Canon Digital SLR and a dried out danish. They noticed us noticing them or we noticed them noticing us (I can’t remember which came first) and finally I just had to break the ice. “Do you like the iPhone 4” I said with a smile, sliding over to get a better look. “Yeah, it’s great” he said with barely a hint of an accent. “The screen is great”. So we started chatting about the phone and the screen and whatnot. He got it in China he said, but it was originally from the UK. I finally got around to the meat of the matter and said “pretty crazy day” pointing over to the reseller nearby. Just then a runner came down, a skinny kid in a crooked oversized baseball hat, and reported to the other man some news. After he left I returned to our conversation. “Was that the ‘top hat’?” I asked. “Ha,” he said. “The top hat is VERY big and watching the kids closely.” Each kid was holding essentially $10,000 HK in cash ($1,200 USA) so the top hat was to make sure the kids didn’t get any funny ideas. “How are you going to get these into China?” where the tax rate is about 20% on imported items like this. “That store opens the box before they sell it to you, ripping the plastic and making the iPad less valuable on the resale market”. His phone rang and he hurried to answer it. After a few words in Chinese he hung up and turned back to us. “The order has changed. Originally it was the 16gb wifi–the cheapest one that we were supposed to focus on, but now the boss says get whatever we can. I guess it’s selling out pretty well all over Hong Kong.” He then turned to his friend who had to communicate the order back to the gang leaders and their underlings still in the line. We got up and said our goodbyes. It was a pretty fascinating look at the process of smuggling, from the outsourcing of the lower end jobs (line sitters) to the handoff of the significant risk (the cross-border entry). With a markup of about 100% for the street price in China, this guy was going to bring in about $200,000 US in profits for just a couple days work sitting in a Starbucks. Maybe we’ll see him again on Friday when the iPhone 4 goes on sale. Here is the video Neonpunch.com shot showing many of the mules who were waiting in line. USB drives to me are kind of silly. I have been living in the cloud when it comes to data for a number of years now and regard USB keys as sort of a throwback to the era of ‘physical media’ when you had to burn something to a disk to transfer it from one party to another. However, due to some business demands, I’ve recently had to go USB drive shopping to pass along about 10 gb of data (that could and should be done server-to-server but that’s another story). So I went down to Wanchai today to look at drives. I managed to find this little 16gb TDK drive buried in the depths of the computer center. I originally wanted a 32gb drive but then priced out two of these 16gb drives at less than the cost of one 32gb drive. The guys I bought from, who have cut me 10-15% discounts on other items before were able to offer me a wopping $3HK discount per each drive (which is about $0.36 US). Oh well. Anyway, take a look at this next to some random items on my desk. The drive is currently being loaded with a number of database files and other documents for a pending transfer in the next 48 hours (provided my contact meets up on time). Too bad it’s not shaped like a button or a cufflink–that would give the whole transfer a modicum of coolness a la James Bond. Not sold in the US just yet but available throughout Hong Kong and Japan. You would think that a place like Hong Kong, which is only miles from the gadget factories in Shenzhen and benefiting greatly from a massive demand for consumer appliances and essentially no customs duties on imports, would have the latest and greatest devices from around the world easily available at the various Computer (grey) markets around town. But yesterday I plodded through one of them with stares of disbelief and wonder, and not just because I was speaking English and showing them pictures on my iPad. The Chumby and the Sony Dash (which has the guts of a Chumby inside) are two Internet appliances that I couldn’t find in Hong Kong. Both are in heavy use in the US, with the Chumby being out for several YEARS now. Chumby is now expanding into multiple devices. But try as I might, I couldn’t find one in Hong Kong. Part of the reason might be usage–most people in Hong Kong are on mobile devices and the thought of a stand alone, sit at home (in your small house) Internet appliance isn’t that appealing. I’ll confess that after having my iPhone next to my bed for a few weeks, I rarely used my Chumby for anything besides an alarm clock. But now that I’m stuck with no iPhone pending the release of the iPhone 4 and no FM radio since we left all of those back in the States, I’m in the market for another Internet device to help soothe my younger son to sleep every night with classical music from Venice, Italy (a station we use because they have no annoying commercials). Unfortunately, these were two gadgets I just couldn’t find anywhere despite looking pretty hard.